Prodigy Finance is revolutionizing student finance. Our innovative model offers alumni-funded loans to international students at the world’s top business schools, including ESMT Berlin. While banks base their loan decisions on historical salaries, Prodigy looks to the future. We assess applicants’ future earning potential (based on the past achievements of similar graduates) to determine loan affordability. Our model is borderless, allowing us to offer competitive rates to over 150 nationalities of students. Accepted students into the Master's in Management, full-time MBA, and the Executive MBA programs are eligible to apply for a loan with Prodigy. Interest rates vary depending on individual applicants. The representative APR is 8.16%. See more detail about the terms and conditions, and how to apply for a loan on Prodigy’s website. For additional information, you may download the latest brochure about Prodigy. Brain Capital offers ESMT degree seeking students who are citizens of the EU, Canada or the USA the ability to cover tuition fees through an innovative funding scheme. It is a proven way to secure the funds you need to support your education goals at ESMT. Repayment terms are very favorable. 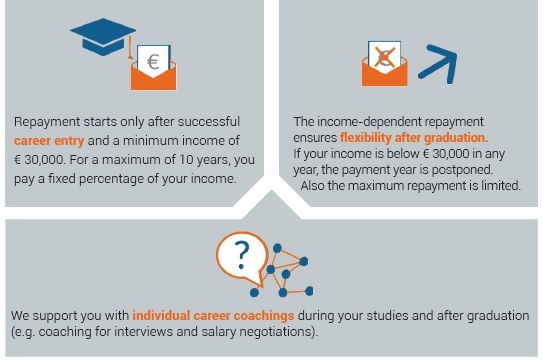 After graduation, payment only starts once you have secured your first job and have reached a certain salary threshold. Please download the brochure for more information. To apply or if you have questions, you can contact Brain Capital directly via email or by visiting their website. Please feel free to contact ESMT if you have any specific questions.